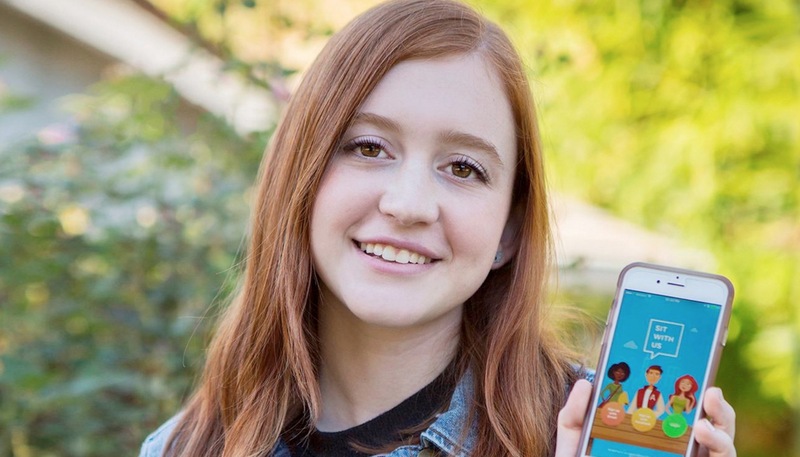 Natalie Hampton, now a 16-years old high school junior currently studying in Sherman Oaks, California, says that she’s been tremendously bullied throughout middle school. She shows her actual scars as a result of the bullying which include bruises on her body as well as a scar on her left hand from when another girl went on to claw her with her nails until she actually managed to drew blood. However, she claims that the attacks, which were definitely horrific, the worst thing has been that she has had to eat her lunch alone every single day as the kids treated her as an outcast. After she switched schools, Natalie managed to find a supportive friend group even though she never actually forgot what it was like to sit alone and feel like an outcast. With this in mind, whenever she saw someone sitting on his own, she’d invite him over and see the look of relief in his face, knowing that he’d just found support. This inspired here to create a new smart phone application which is called Sit With Us. The concept behind the app is pretty simple – the app is allows different students to reach out to others and let them know that they are more than welcome to join them at their tables in the cafeteria in the school. Natalie believes that even though every school has a lot of bullies, there are even more kids who want to make their schools a lot kinder and inclusive. The application calls upon these individuals exactly to help those who feel like outsiders to fit in. Even though lunch can seem like something insignificant, over time it’s capable of definitely shifting the entire dynamic. Natalie also says that both teachers and parents can also be a part of the entire solution by assisting with the coordination of the Sit With us programs and facilitate with topic discussion throughout lunch time in order to bring more people together and help them become closer. She says that her high school places a lot of emphasis on community service. On the other hand, she believes that fighting bullies should be initiated by student-led organizations. Currently, Natalie is working on a version of the app fit for Android OS but for those who don’t have an access to an iOS phone she reminds that there is a low-tech version – a simple yet prominent bulletin board. There, ambassadors can actually post notices for open lunches which different kids can check. Upon finding a table which is open kids can simply go ahead and join it. Natalie hopes that the entire idea manages to spread throughout a lot of schools so that at least kids can remember to reach out to others with acceptance and kindness. Bullying is without a doubt an issue that needs to be effectively dealt with because it’s capable of scaring a person for life. It is without a doubt true that there are grown-ups with deep emotional issues because of excessive childhood bullying. Even though it’s easy to blame the parents in a situation of the kind, it’s also worth noting that school communities aren’t very active as well. Through the implementation as well as through the spread of applications as well as other incentives such as the aforementioned smart phone app, kids are provided with the chance of socializing in an effective way without inflicting traumas and deeper issues. Furthermore, this is going to enable them to make new friendships and bond over a cause which is definitely for the greater good.